I'm not big on dressing my dogs up for Halloween. They hate wearing the weird costumes and I hate dressing them. It's hard enough trying to dress a toddler in a chicken suit without the extra stress of trying to stuff an 80 pound dog into a bee costume. And the prices of pet costumes are ridiculous. You want me to pay thirty five bucks to dress my dog up like a bunny? No freakin' way. For that amount of money I could get myself some real bunnies. And they would beget more bunnies. Then I could start making some money selling bunnies instead of spending money trying to turn my poor dog into one. If you insist on dressing your dog up on Halloween at least consider buying them something they can wear again and again. Like this. Call me silly but I got such a kick out of the fake bling on this doggie sweatshirt. If I had a smaller dog in need of outfitting I would totally turn him into a pimp. 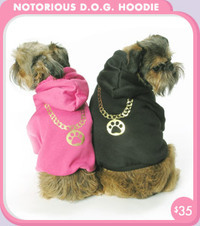 I would buy him a cute, but masculine, rhinestone collar and matching leash and finish it off with this hoodie. Then I would set him loose on all the fine shorties at the dog park. And his name? It would be Snoop Doggy Dog, of course. Notorious D.O.G. Hoodie available for $35 at Trixie and Peanut. Here at Dog Gone Blog we understand that there are certain types of breeds that require outwear, particularly in colder climates. If your Min Pin is going to be outside for an extended period of time put a coat on that pup. Yes, the shih tzu needs a sweater when you're taking her for a walk. And a Weimaraner is not going to be able to handle being outside on a snowy day without outerwear as well as a Siberian Husky with it's built-in insulation by way of a double fur coat. What I'm trying to say is this, I have no problem with necessary clothing for dogs. But this is taking it to a whole new level. Mothers and daughters do it (so I hear). Old married couples do it. So how about you? Wouldn't you like to dress like your dog? 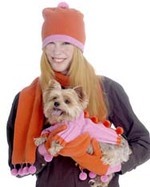 At Woozie Wear you can get t-shirts, raincoats, sweaters and accessories for you and your dog. You can both be matchy-matchy. Doesn't that sound super cool?! If this sounds like it's up your alley check out Woozie Wear's line of coordinating clothing for women and their dogs. Funny, there's no men's clothing. Hmm. I wonder why?